The "left-handed designer," Seymour Chwast has been putting his unparalleled take — and influence — on the world of illustration and design for the last half century. In his version of Dante's Divine Comedy, Chwast's first graphic novel, Dante and his guide Virgil don fedoras and wander through noir-ish realms of Hell, Purgatory, and Paradise, finding both the wicked and the wondrous on their way. 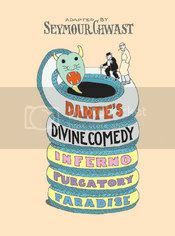 Dante Alighieri wrote his epic poem The Divine Comedy from 1308 to 1321 while in exile from his native Florence. In the work's three parts (Inferno, Purgatory, and Paradise), Dante chronicles his travels through the afterlife, cataloging a multitude of sinners and saints—many of them real people to whom Dante tellingly assigned either horrible punishment or indescribable pleasure — and eventually meeting both God and Lucifer face-to-face. In his adaptation of this skewering satire, Chwast creates a visual fantasia that fascinates on every page: From the multifarious torments of the Inferno to the host of delights in Paradise, his inventive illustrations capture the delirious complexity of this classic of the Western canon. I'm not even going to waste much time on this review. I didn't really like the book. At all. The only reason I'm giving it 2 stars is that it may open up the possibility to someone to read Dante's actual The Divine Comedy because of the simplistic telling here. It may help someone who feels the story too daunting to understand a little better what's happening. Maybe. It's the simplicity that detracts me from enjoying this volume. Chwast takes the epic poem and breaks it down into one line synopses and the crudest illustrations possible to retell the story. I see lots of praise for Chwast and his graphic sense, but honestly, I saw nothing in this book that impressed me at all. I thought the illustrations childish and not very easily understood in some cases. Not recommended, especially if you have ever read the original and enjoyed it. In that case, avoid this at all cost.